On this international floorball day we’d like to share the results of the ladies team in our competition: Bronze! A solid third place for the HSK Agents. The team is proud of this and looks back on a season of growth, hard work and fun. At the beginning of the season the team had mostly attackers and struggled to keep a well closed defense. During the season the team trained hard, worked on improvement and made sure the team got stronger. During competition phase the ladies team has 10 games, of which exactly half were won and 4 were lost, and 1 drew. This resulted in a third place for competition, and reassuring the team with a spot in Play-Offs and in Premier League next season. The play-offs were played against Hot Flames 1, a strong team from Nijmegen. Hot Flames had won 7 of their games in competition, making them statically stronger than HSK Agents. The Play off system is a best-of-three, which sadly was set after 2 games. HSK Agents was unable to win against the Hot Flames 1 team but made it real hard for them to score and both games were very well played. The ladies team is determined to keep up the hard work and aim for a high result in the new season. The brand new season 2017-2018 has started. The brand new season of 2017-2018 is underway. During this season HSK Floorball will train on Tuesdays and Thursdays at hall at Roemer Visscherstraat 108 in Den Haag. Both these training sessions are from 20:00 to 21:30 and open to men and women. The teams for the season are for the men HSK 1 in the Eredivisie and HSK 2 in the Eerste Divisie. Both teams are still open to more players. The women will also compete once again in the Eredivisie together with the FB Agents from Amsterdam as HSK Agents. As with the men this team can still use more players. New this season is a training for junior members age 8 to 10. These take place on Fridays from 16:30 to 17:30. If you have a child that’s interested in playing and learning floorball please contact us. Start of the new season! As in previous years our trainings in the upcoming 2016-17 season will be held on Tuesdays and Thursdays in Roemer Visschercollege in The Hague. One change is that on both days we will now start at 20:00. The first training of the season will be held on Tuesday, August 30. We hope to see you all ready to rock on this day as we have big season ahead of us. HSK has started cooperation with Agents (for ladies team) and Breda (for men) and therefore we are entering the season with 4 big field teams at various levels of competition! Our ladies team is expected to be very competitive as both HSK and Agents contribute solid veteran players . Men teams are poised to put the disappointment of past season behind and fight for top positions in respective divisions. In 2016-17 we contribute players to the team in 1st division (our entirely own team) and 2nd division (mixed with Breda). That should provide good challenge for our players of all levels and both teams are expected to be very competitive. Dust off your sticks, wash the outfits and… see you on August 30! 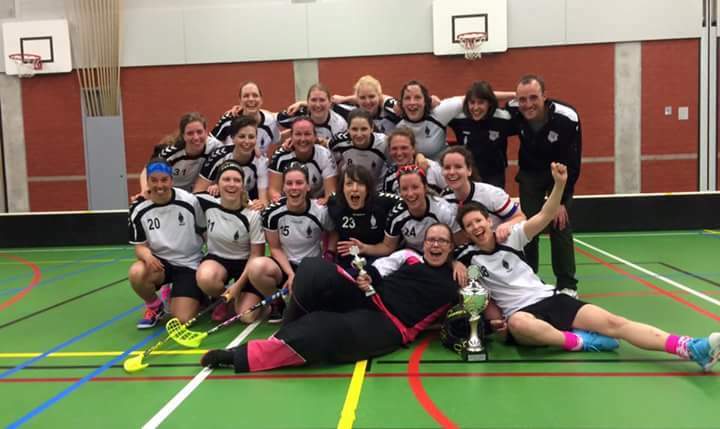 HSK Ladies Champions 2015 – 2016 !! On Sunday 22nd of May the HSK Ladies won the play off final from rival Sonics Amersfoort in a crowed and atmospheric hall in Utrecht. The HSK ladies came out first in the regular competition, so were starting the game as the favourites to win the final. After a very quick goal against, the ladies woke up and showed during the rest of the match that they are truly the best team of the season 2015 – 2016. At the end of the second period the HSK Ladies had a firm lead. With a total of 32 shots on goal against 17, Sonics Amersfoort was beaten with 7 – 4. The board of HSK congratulates the ladies and coach with a wonderful result! Go HSK! For all the details see the game report below.